To gain a 'NewStart' in our lives, we need to look for change. Doing the same thing over and over and expecting change is foolish. Come to be heard and focus, seek real help - Counselling & Psychotherapy in Milton Keynes. We offer a Free Drop-In Service on the Minibus, for crisis listening and emotional support, and we also offer Counselling & psychotherapy. Now known as 'NewStart' formerly the Bus-Stop, has evolved and has been running for a few years now (since April 2009) and is based in the Central Milton Keynes market shopping area, serviced by students on recognised courses. We also have offices for in depth Counselling / Therapeutic work with qualified Counsellors / Psychotherapists. 'NewStart' is a 'Drop-In' open facility for Counselling and we offer supplementary training and supervision to our student volunteers. The service offers 'Free Crisis Listening, Emotional Support & Counselling' to the general public. All our volunteers are CRB checked and are members or student members of the BACP. 'NewStart' maturer student counsellors, who are on an established training course may also host regular counselling clients on contract (donations required) with student counsellors who are all on professional counselling courses. For those with deeper issues and mental health problems we offer qualified counsellors in our counselling offices at ACORN HOUSE. We have break out facilities when we are very busy. 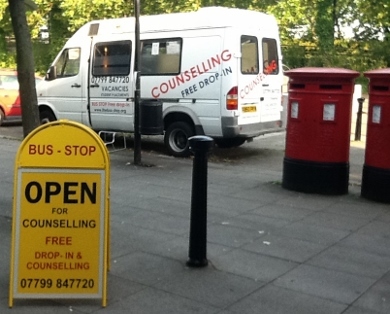 Please also confer with the other page that explains the 'New Start' Minibus Caravan Drop-In, and the full Counselling services offered at the Mini-Bus. IMPORTANT NOTE: There are also Resident Qualified Counsellors for referrals, who may be called upon at our CMK head office for in depth general counselling or someone more experienced in Specialised TRAUMA (PTSD) work. The old picture of the Minibus, before the new signwriting, which is currently located in The Market area at ‘Market Square’ near to the Crown Walk Entrance (No.8) in Milton Keynes Central Shopping Centre. This project development, by the original 'BUS-STOP' Free Drop-In & Counselling Service Limited, was born out of a need in Milton Keynes for a Drop-In Crisis facility to open on a regular daily basis. This was primarily set up at the outset, due to the fact that there was no evidence of an adequate daily drop-in facility available for a weekly crisis cover in the Milton Keynes City area. We believe that more of the main mental health counselling services in the City have been withdrawn for financial reasons and the Bus-Stop service is even more necessary and useful than ever. When the service was initially established there were obviously other help agencies with surgeries, open by appointment, though only a few specific times and certainly not open most week days, or at the weekend, when clients also need support. Now we are unsure if there are any proper services offered on a drop-in basis for general counselling needs for all ages, from 16 -80+. The 'New Start' Drop-In facility is currently manned by locally trained volunteers (for befriending and some will also be available for counselling) and they will be either, student counsellors attending training courses in a College, University or Institute, or others 'qualified' counsellors who will carry out long term contract Counselling or Psychotherapy work. Our volunteers are all supported by qualified and regulated supervision. Insurances are in place for befrienders, although for full 'counselling contracts' our students and qualified professionals also have their own private insurance, as a normal safeguard. We have located cheaper rates to help students keep the costs down.. Email us to get details. Our Drop-In Service is located at:- Market Square, Central Milton Keynes. OutsideCrown Walk - Entrance No. 8, by the big red 'Post Boxes'. A not-for-profit Limited Company No. 07605605. A Community Interest Company, Registered in England.under Fresh Inspiration Charitable Trust.